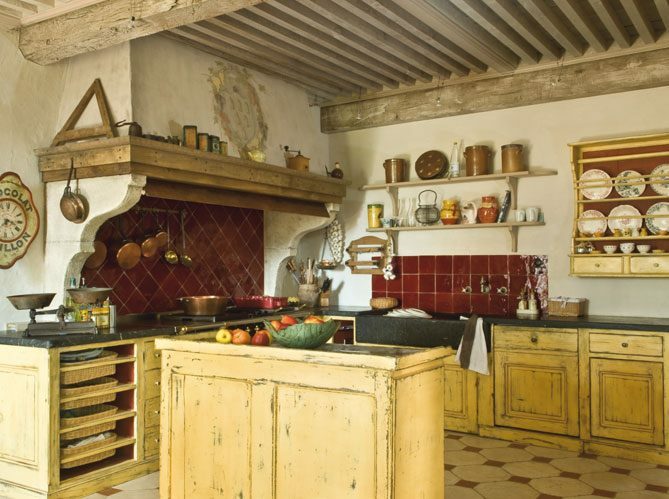 I've always been drawn to rustic, old world scullery kitchens from France and Italy. However, it would be a pain to actually work in one. Can you imagine doing dishes in this sink? 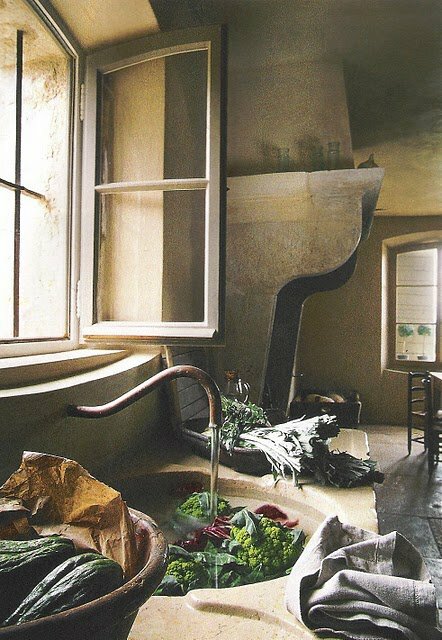 There is a fine line between a kitchen with patina and one that has all the modern conveniences. Materials like stone floors, beamed ceilings, plaster walls and old copper pots lend the look and feel of a scullery kitchen. It's possible to have those elements and have a functional kitchen too. Open shelving is another element that says "scullery!" Old French tiles and a designated alcove just for the range. That's what I'm obsessing about today. 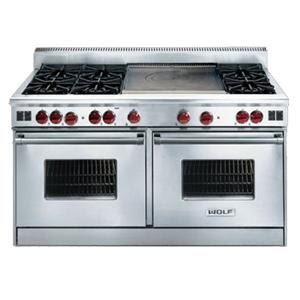 Three months ago, we ordered a new Wolfe range. It's now ready to be delivered, so I'm in the process of preparing for its new home. It will be freestanding, just like the stove above, except the wall will be tiled in white subway tile. 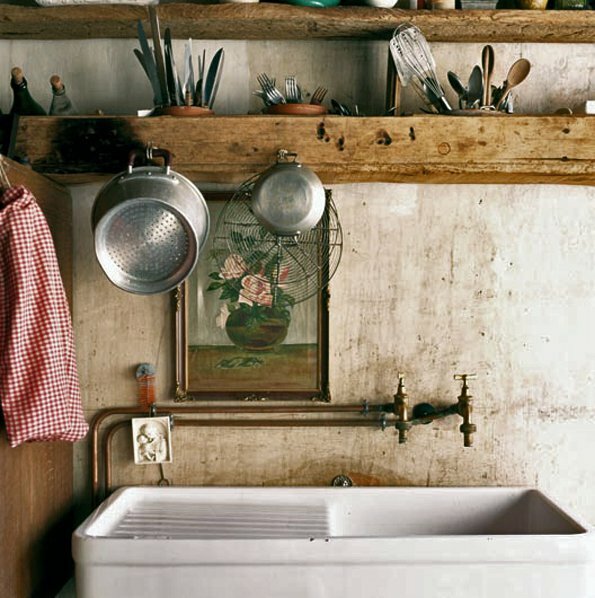 In keeping with the scullery kitchen look, I would love to hang copper pots on the wall, like above. Love how the hooks are mounted on an old wood plaque. It's stage 2 of the kitchen facelift that began in October. It's going to be a little trickier because the floor will need to be patched and possibly reinforced to hold this behemoth! I just love pictures 1 and 6 Delores, definitely drawn to those wooden shelves. Until I was in fourth or fifth grade, we had a sink very similar to the first photo. When hubs and I moved back here to my 150 year old family home, we did a major reno of the first floor and had a lot of shoring up to do, so I understand where you're at. Love every one of the kitchens pictured. 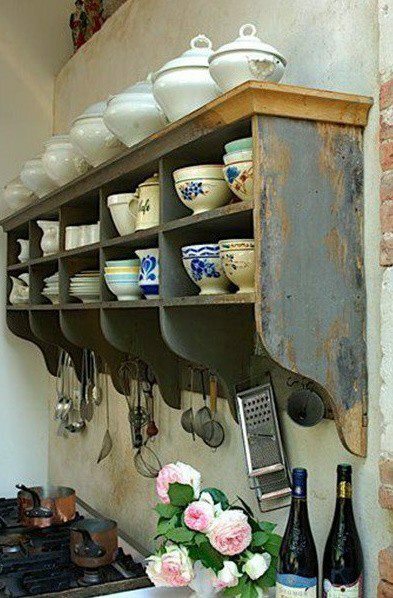 Have used many of those elements in my new country house...plate racks, open shelving, fabric underneath counter tops, copper pots hanging over the professional cooktop. My copper pots hang from bicycle hooks which are covered in a resin type material. The hooks look a lot more friendly than the typical kitchen hooks. Delores, doesn't sound like anything is slowing down at Vignette Design. The new stove will be wonderful. Delores I loved everyone of those kitchens!! Hi Delores! Long time no talk to. Looks like all is well and you are busy as a bee, as usual! Anyway, just thought I'd say "hello" and wish you a very happy new year. Oh you lucky duck - I LOVE that stove. It would take up nearly my whole kitchen though LOLOLOL In your top picture I don't know about washing dishes in that sink but I sure love the shelf right over it...it looks like an old beam except with hole to put "stuff". Love it and may try to make one for my kitchen. I would have just enough room to run it all along one wall and over my sink. Thanks for sharing the pictures! 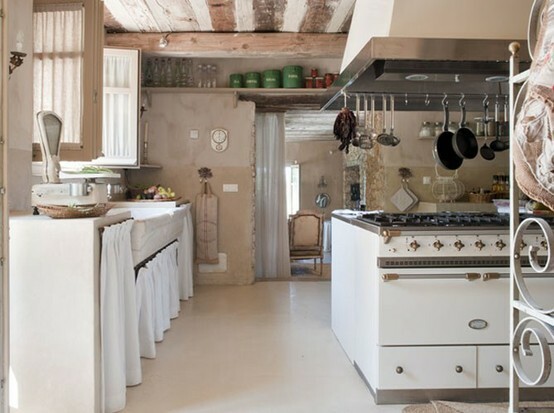 Love it, and this look was very much a big inspiration in the planning of my own kitchen (except with all the modern conveniences, I am not that much of a purist that I could forego dishwashers, and fancy gadgets, haha) but this old world look is very appealing to me, and so classic. I love it....its been a wonderful room to plan and realize a dream I have had for a long long time. I love all of your above inspirations! Lovely photos. I really like the little skirts on the sink beamed ceilings and gorgeous floor tiles. 1,2,5, and 6 are my favourites here. Love the worn paint against textured walls. Perfect. Wonderful photos! I'm so excited for you and your new range! You will LOVE it. Did you get the red knobs, or black?! I love all these pictures. They speak to my heart. 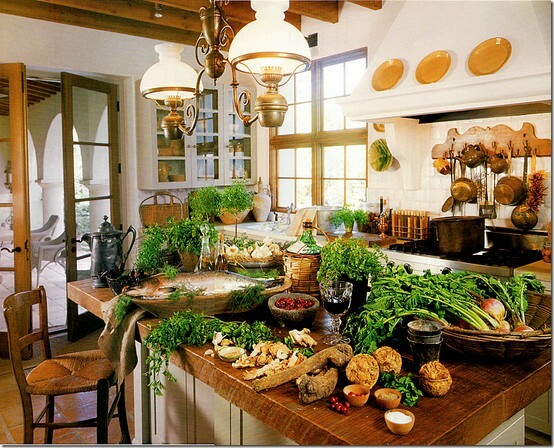 I pinned a few of them for my next kitchen inspiration. What a fabulous range. I cannot wait to see how you incorporate it into your kitchen. The scullery look is charm-filled. 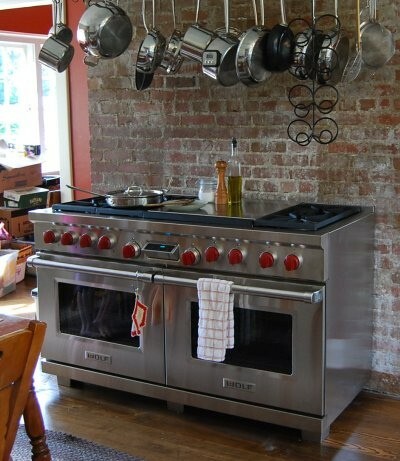 Reinforcing the floor will be so worth it to have that beauty in your kitchen! I love all of your inspiration photos! I'm laughing, because the sink in the first pic is the exact one I have in France, and yes, it's a pain as it is so small! One day I will have one in limestone next to a LaCanche range! I also love this look. I never get sick of it. What fun! I love, love, love the new range! 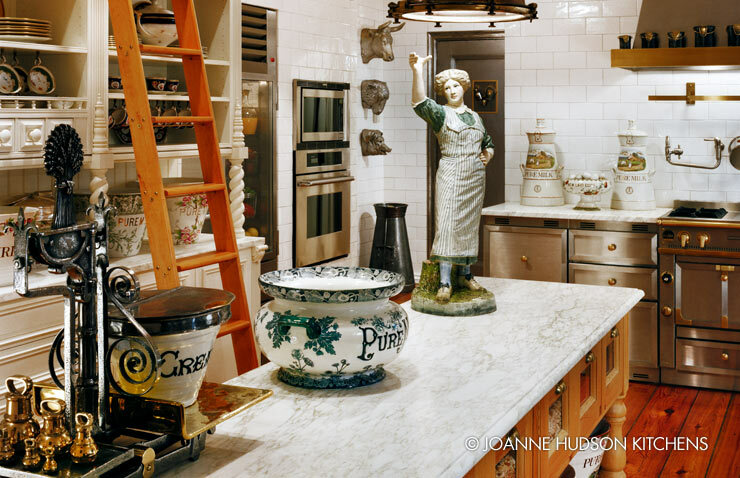 It is so much fun to collect ideas...I enjoyed looking at all of the kitchens! copper pots hanging. Designated alcove for the stove. Great stove YOU have got coming! subway tiles? What did you seal your marble with? @French Basketeer - I have been emailing you about a basket order I placed and no reply. Are you in Europe? We have copper pots and trays above our stove...I really use them, too. 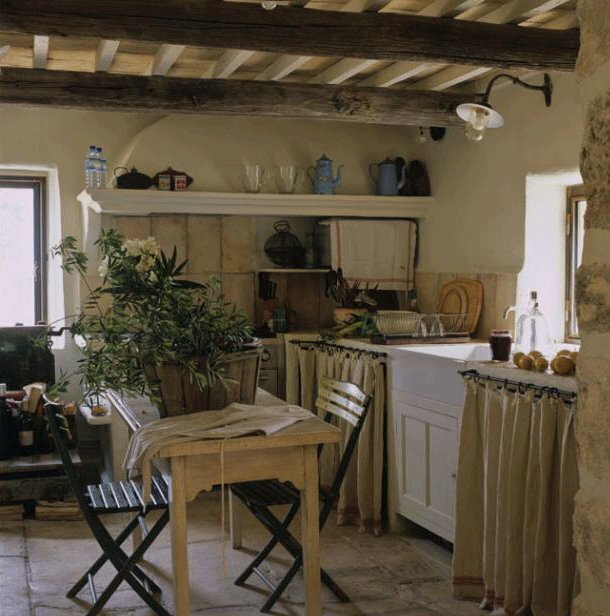 These kitchens remind me of places we have rented in Umbria or Provence...very useful with homey patina.